In October 2018 I visited Kent State University to co-facilitate leadership workshops in the School of Education. 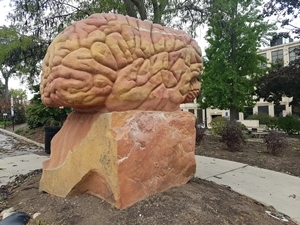 I was especially taken by a small sculpture garden they had created on the campus, known as the BIG & SMALL BRAIN - an apt choice of subject in this seat of learning. Sculptures of the brain were bedded in a garden whose seats and walls were made up of a stone library.How can we use sculpture in our schools?